My kids finished school last week, and while I am VERY excited to have the summer off from school, I am also very grateful to the wonderful teachers that all of my children had this year. It was a crazy year with a lot of uncertainty and changes, but the kids had truly stellar teachers, and it made a huge difference! We took the easy route and contributed to class gifts for all of the teachers, but I grew up writing thank you notes to teachers that I loved and it’s a tradition I have carried on with my own kids. 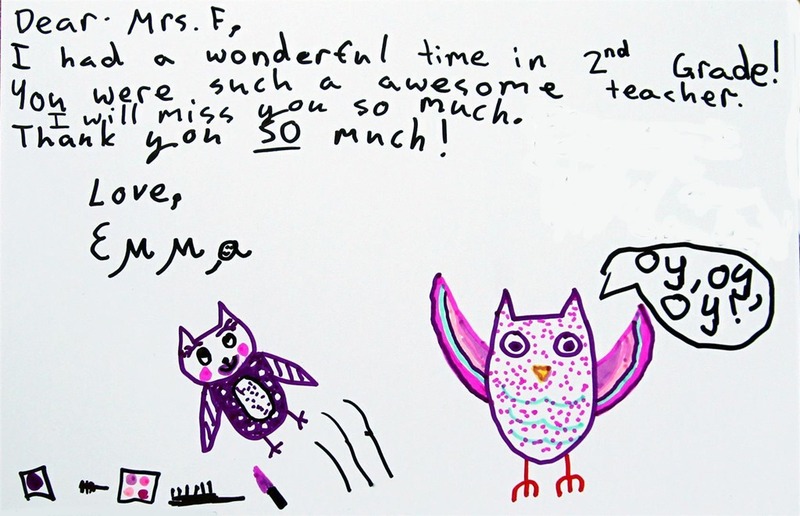 Heartfelt thank you notes for teachers are always appreciated, and they don’t have to be complex! Eight-year-old Emma came up with both of these – she had two classroom teachers this year – and I love the work she put into them. 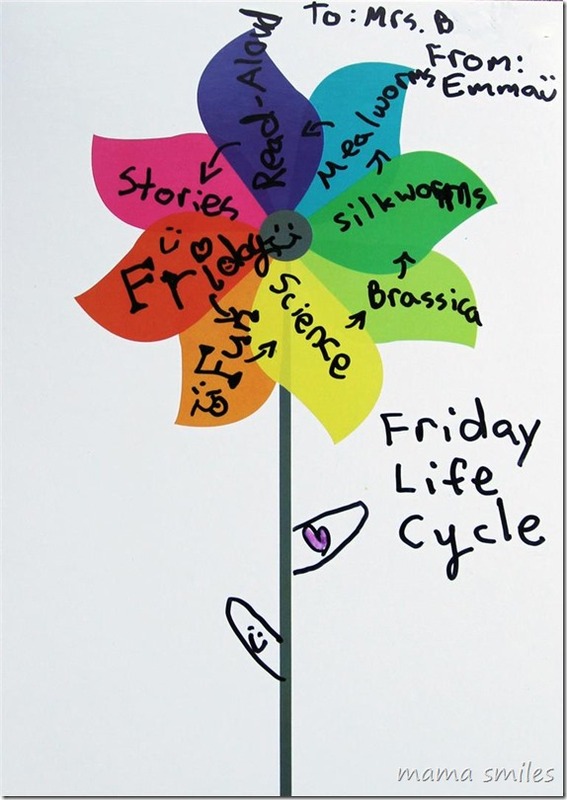 I thought her use of the pinwheel (which she turned into a flower) to show how much she learned from her once-a-week Science teacher was particularly clever! The teacher Emma had during the rest of the week had a wonderful personality and sense of humor, and I love that that influence shows up in Emma’s thank you note. Emma can be very reserved and quiet, and I think it was really great for her to connect with a teacher with a very different personality. She learned a lot, too – they did some writing activities that I particularly admired! Johnny also made very nice cards, but in the chaos of getting the kids off to school at the end of the year with Mike out of town for the week meant they never got photographed. Next year! Do you have a favorite way to tell teachers thank you? Are your kids on summer vacation yet? Do you have any fun summer plans? We are excited to travel back to Massachusetts later this month! 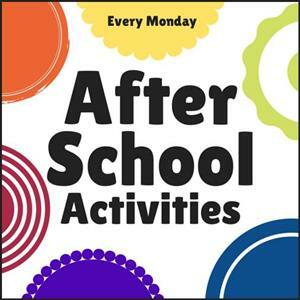 Please share you elementary school aged activities in the linky below (by doing so you are giving the linky hosts permission to feature your post and to pin it to our After School Activities board on Pinterest). I loved this mixed-up chameleon activity from Buggy and Buddy and these fun dye art activities for kids from Kids Activities Blog that were linked up last week! 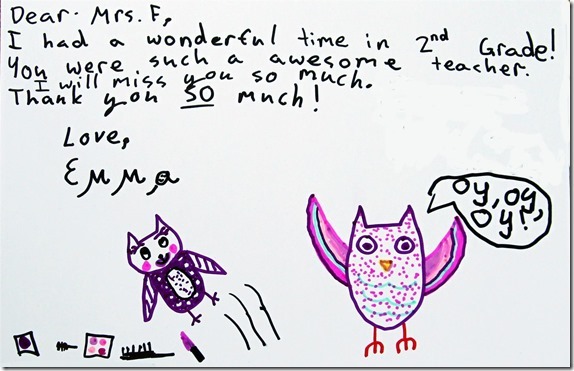 Emma made wonderful cards, and our experience shows just how important it is to have the right teacher. I’ll see if Anna will be inclined to write another note to her teacher – she is actually quite fond of Mrs H, and sad that she will not be with her this year. I am of a different opinion, but we agree on one thing – we are all so looking forward to the end of this year! I hope you have a better teacher experience next year! We make them lunch buckets! But only their homeroom teachers at school, because otherwise it would do me in. I love that the girls want to thank their other teachers, too, so our teacher-list is usually more than 20 names long , including Science teacher, GT Program teacher, library teacher, PE teacher, art teacher, music teacher and their outside-school instructors for gym, swimming and sunday school. They get bookmarks and cookies and thank-you notes, so that (unlike the lunch buckets), the girls can get fully involved in making and writing. It’s quite an undertaking, so we plan this weeks ahead of time and the girls work at their own pace, picking up only at the end when I have to remind them of deadlines. It feels like Christmas! Forgot to add, MaryAnne, that having been a teacher myself, I always loved the hand-written cards and notes best. And food, of course. And anything hand-made. Inexpensive but heartfelt is best! Maybe that’s why we do this every year. Some years, depending on how good our planning was (or not! ), we get it all in, and some years, only school teachers get anything at all. I usually let the girls direct what to give, and to whom and how elaborate they want to get. It’s about their relationship with their teachers after all, even if I, as a mom, love their teachers too, and am grateful for what they invest in the lives of my kids when I’m not there, not to mention the excellence with which they do it. Thank God I’m not the only one who shoulders the responsiblity (and privilege) for their education! I love the gifts you make for teachers! Great teachers transform lives, and I don’t think there is a way to adequately say thank you! I love that your girls are so grateful for ALL of the teachers in their lives. For some reason I hadn’t thought of hand-made cards from the kids for their music teachers – I had just gotten them things like stickers and stationery items they can use for their students. Nikki enjoys sewing felt pouches that close with buttons for everyone she likes at the moment. I am impressed that Nikki is sewing buttons! I am sure that your children’s teachers appreciate the stationary and stickers, also! Emma’s notes are lovely! We have 3 more weeks of school to go so I am grateful to you to remind me about end of the year teacher gifts which we are not supposed to give, but everyone does. I like my kids to write thank you notes too but only my 3rd grader will do it. The middle school girls will be hard to convince. I like to give personalized signed books to teachers; my son’s 3rd grade teacher also loves author events! If I can’t pull of a signed book, perhaps just a favorite books for 3rd grade. I love the idea of personalized signed books! As a former classroom teacher, I can tell you those sweet little cards brought a tear to my eyes. These personal notes from students mean so much! 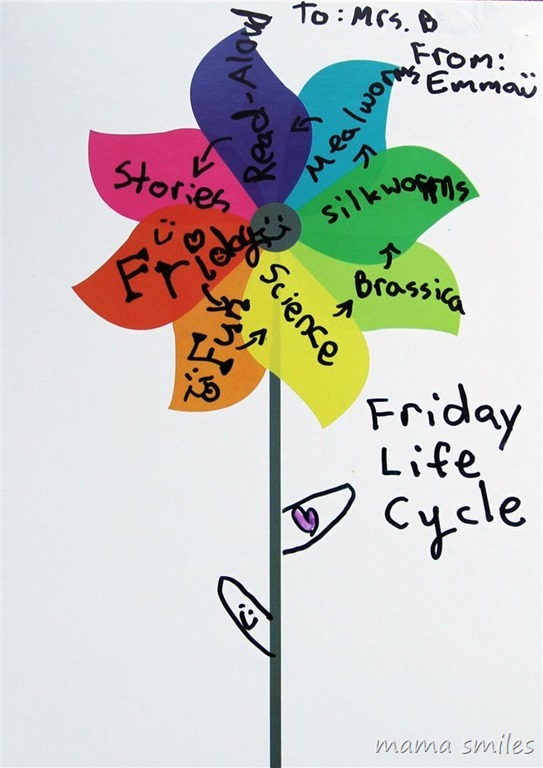 The pinwheel is a fabulous idea! As usual I’m inspired by the creativity of children. Thank you, Jeannine! I love that these notes get my kids thinking about how grateful they are for their teachers. I’m with LiEr, I always loved the handwritten notes and cards the most, especially because I didn’t necessarily need yet another cute teachery thing. I’m horrid at getting my kids to put together teacher gifts for their Sunday School teachers or things like that, horrid. It’s really kinda sad, I always remember it at the last minute, right before we head off to church. I do well with school teachers, but definitely need to be better about thanking Sunday School teachers. They do so much! Wonderful! There’s nothing better than a handwritten note. That’s so great that you carry on that tradition.